Sending loads of congratulations to Carol and Pete, who were married on Saturday 10th June at The Old Parish Rooms, Rayleigh, Essex. The weather was perfect; lots of sun which shone through the huge chapel windows – one of the best features of The Old Parish Rooms. 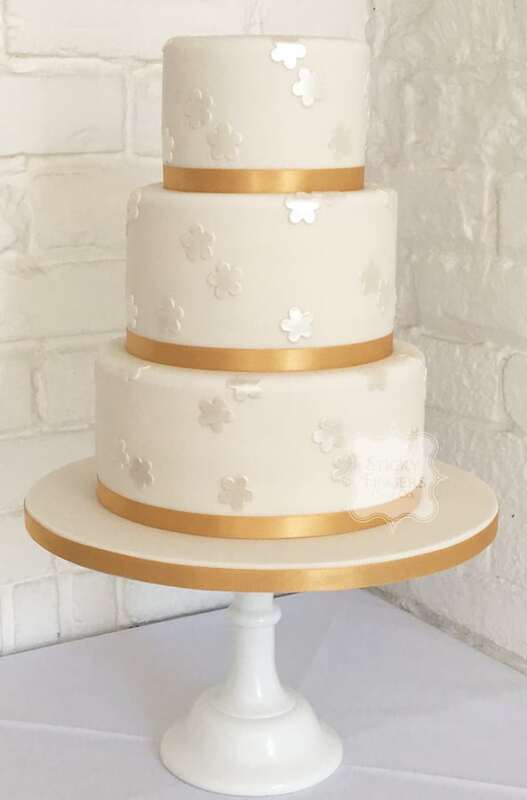 The happy couple decided on a white iced 3 tier wedding cake very simply decorated with sugar blossoms and dusted with an edible pearl lustre to give it a bit of sparkle (we love a bit of sparkle!) The cake was going to be topped with a fresh flower arrangement in Yellow and white which their florist was supplying and was displayed on one of our American Milk Glass stands which really lifted the cake. The flavours they chose to have were Lovely Lemony Lemon Cake, White Chocolate and Passion Fruit and finally Rich, Dark Chocolate. Hope you had the happiest of days with your family and friends!